using water, reducing water loss, and improving water quality. and drought tolerant. Another is the use of drip irrigation vs sprinklers. use on plants. A central home unit can produce 5 to 20 gallons of water a day in the summer. 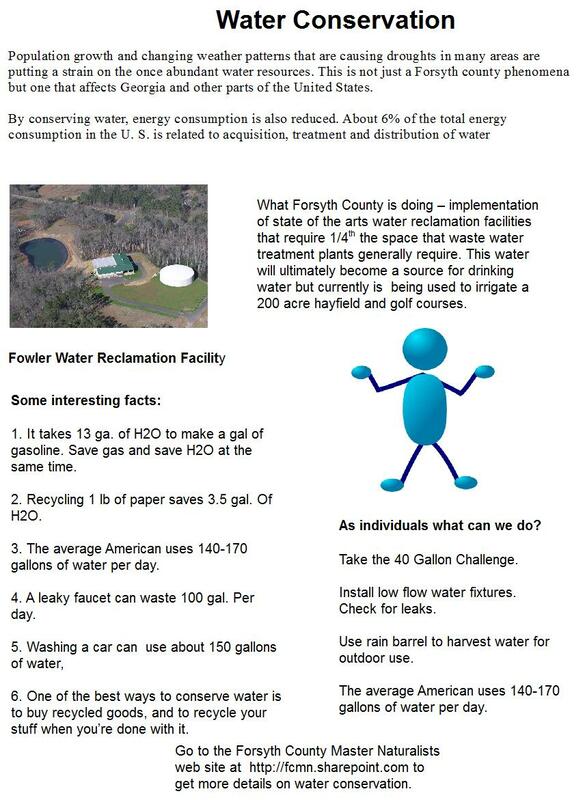 Click me to see water conservation efforts in Forsyth County. By UGA News Service on June 29, 2011; Researchers from the University of Georgia Odum School of Ecology have found that certain neotropical stream ecosystems rely almost entirely on a single fish species known as the banded tetra for the critical nutrient phosphorus. In a paper recently published in the journal Ecology, the researchers, led by Gaston E. “Chip” Small, explain why this particular species plays such a crucial role — and why these stream systems are vulnerable as a result.